Leeds has always been a hotspot of awesome creativity, and even in the (almost) two years since I opened my shop Snake & Tiger (where does the time go? ), some brilliant new tattoo artists have emerged alongside the experienced hands that have earned their reputations over many years of top quality work. “Leeds is home to plenty of international-level talent regardless of what you’re after.”say Confidentials Leeds in this piece on the best tattooists in our bit of Yorkshire that came out a couple of weeks ago. 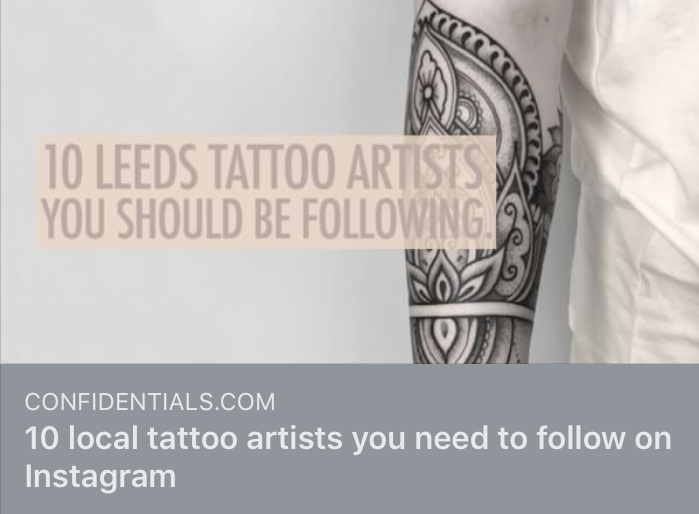 I’m in some truly great company on this list of ‘10 local tattoo artists you need to follow on Instagram’, with some well established Leeds tattoo artists I know well plus some amazing newcomers who are sure to get even better as the years go by. Thank you to Confidentials Leeds for including me, but it would not be possible without my awesome clients.